Wishing you could make it home for the holidays? We know that gas is OUTRAGEOUS and we want to help you out! 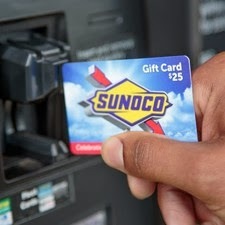 Enter below to win a $25 Gas Card from Sunoco! Looking for a Sunoco station near you? Check out their Gas Station locator page! I'd love to travel someplace warm. I'd like to go to DisneyWorld! We will be driving to my mother in law house in Florida. We will be going to New York to see relatives. I'd love to go to So. Carolina to visit with my Dad and my brother & his family. I would like to go to Florida. I would love to be in Florida where it's warm. I'd most like to travel to see my family in Northern Michigan. I want to travel to relative's houses in Pennsylvania. I would like to go to Gatlingburg, TN. I want to drive my kids around to see all the Christmas lights in our town. I don't want to travel anywhere I just want my babies. I would love to travel out of state to see my parents for Christmas. I'd like to visit NC! To Grand Marais Minnesota so my children and I can spend more time with Daddy :) He works out of state and travels regularly for his job as a cable lineman. It's no fun when he's away but his job makes it possible for me to be a SAHM to our 3 beautiful children!! I really miss my mom! I have twins, so she does not get to see them much. Id love to use this towards that trip home!! I'd love to travel to California! I would like to go home to ny with my family. To our new home in West Virginia. I am luck that most of my familly lives locally! But I do have some on my mom's side that live in Charlotte about three hours from me. I would love to take my mom to visit them since she doesn't see them often. I would like to travel to see my sister and her family this holiday. I would love to go to North Carolina! I want to travel to spokane, wa to see my dad! Up to IL to visit my family there. I would love to travel to South GA.
Someplace warm and sunny, as long as my family is with me. I'd like to take my kids to the Creation Museum for Christmas Town. I'd love to go somewhere with great skiing, like Colorado or Vermont! If we did travel Id like to rent a cabin for my family in Hocking Hills in Ohio. We really want to go to Texas to see our son, daughter in law & 3 granddaughters. They moved 3 years ago, came home for Christmas the following year & we've not seen each other since. So it's been 2 years. Our youngest granddaughter will be 2 in January & we've never held her or kissed her sweet little face. I travel a lot for work so I'd really love to just stay home and relax! I know it's boring but home is so underrated sometimes! I want to travel a few hours south to see my husband's grandparents.They are both not doing well health wise and my kids miss them. Not far just to my sons house about 18 miles away. I hope we have ok weather I so want to see my grandkids. The way the weather is, somewhere warm, and not too far. I just want to be here at home. We don't travel much, we just go to our parent's, they all live close thankfully. I'd love to go to Gulf Shores, Alabama for Christmas! It'd be awesome! Wow great information. If you want to learn driving and live in North West or Hornsby area then Cherrybrook Driving School is the best place. Hills driving school.